Whether you are buying an old Victorian or a new, custom-built home, you could be sharing a roof with unwanted visitors—pests. Just like you never know what’s lurking behind the walls, it’s hard to tell what underlying pest problems a home might be hiding. Did the previous owner have a termite warranty? Many termite warranties are transferable to new owners, and the type of warranty determines the costs that are covered—either retreatment or retreatment plus repairs. When was the roof last replaced? New roofs are less likely to have leaks and are better sealed against the elements, which means more energy savings and fewer pest entry points. Have you had any exclusionary work done? This type of work includes simple maintenance like screening windows, caulking doors and patching holes around the outside of the home—all of which help seal up your home and keep pests outside where they belong. Have you had any pest issues? This may seem like an obvious question, but if you are buying a home outside the typical pest season, it may not come to mind. However, it’s an important one to remember because a history of termite or other pest problems could mean you need more robust, ongoing pest control. Whether your new home has existing pest problems or not, proactive pest control is the best way to keep insects, rodents and wildlife away. To help you settle in, we’ve created a comprehensive guide of the pests to look out for, the warning signs of a pest problem and the to-do’s that should be at the top of your move-in checklist. 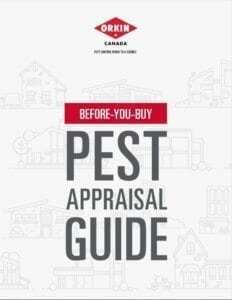 Download the full Pest Appraisal Guide here. What attracts ants into my home? How do I get rid of ants and prevent their colony from growing? Get the answers to the most frequently asked questions on ants, all answered by the experts at Orkin Canada. How do I know if I've been bitten by a bed bug? How do I identify a bed bug when I see one? Get the answers to the most frequently asked questions on bed bugs, all answered by the experts at Orkin Canada. We’ve all seen them before. They scamper across the floor and the walls, causing panic as they appear around corners or amongst stored food items. But don’t be fooled by the fact that cockroaches are so common—they’re still some of the filthiest pests imaginable. It’s easy to think of bees as aggressive or harmful, but the truth is, they’re quite beneficial. Bees are pollinators, which means they help plant populations bloom and thrive. So, while they may annoy you at a backyard cookout—or potentially cause an allergic reaction when they sting—bees are also essential stewards of the environment.